Premium Compatible Label Tapes for the Brother P-Touch D200BWVP printer. The Brother P-Touch D200BWVP is a compact label maker for the desktop that is easily portable.The printer is able to create stylish labels for the home and office users. The printer measures 16.5 cm x 15.5 cm x 6.8 cm and it weighs 490 g. The printer comes with handy hard suitcases. The printer has dedicated one-touch keys that allows to quickly access fonts, symbols, frames or deco mode patterns. The printer incorporates a graphical display that lets one to preview the text, so that one can know the appearance of the label before printing. 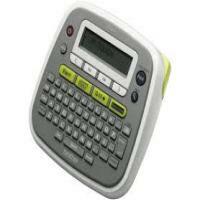 There is a one-line, 15-character LCD display screen and a neat QWERTY keyboard for easy viewing and editing of text. It allows to create personalized, decorative labels using the large variety of fonts, frames and symbols with Brother P-Touch D200BWVP label tapes. The printer is compatible with laminated tapes from the width 3.5 to 12 mm. It has a print speed of up to 20 mm / second. It uses thermal transfer technology for printing means it does not require ink or toner. The printer integrates a manual label cutter to clip the label after printing. Designed to use with Brother P-Touch D200BWVP Label Tapes, the model is equipped with a power adapter and can be used immediately. The Brother P-Touch D200BWVP is capable to create stylish labels for the home and office uses. It has convenient one-touch keys for easy typing and editing of text. It features an array pre-designed labels, by which it is easier to stay organized. Q. Why is the ink ribbon coming out from my Brother P-Touch D200BWVP when I print a label? A. There may be slack with the ink ribbon in the tape cassette. Remove the tape cassette from the label maker and make sure that the ink ribbon is tight. If the ribbon is not tight then tighten it by turning the black spool in the cassette clockwise until the ink ribbon is tight against the Brother P-Touch D200BWVP Label Tape. The ink ribbon in the tape cassette may also be broken or severed. Replace the tape cassette in that case. Q. What makes Brother P-Touch D200BWVP label printer unique in? Q. What is the print speed for printing labels from Brother P-Touch D200BWVP Label Tape? A. The printing speed is up to 20mm / sec for printing labels from the Brother P-Touch D200BWVP. Q. I am not able to cut the labels properly from the cutter unit. What should I do? A. If the cutter blade becomes blunt after repetitive use and the Brother P-Touch D200BWVP Label Tape cannot be cut cleanly, then replace it with the new cutter unit. Q. What safety measures I should keep while handling the Brother P-Touch D200BWVP printer? Do not touch the P-touch labeler during the lightning storm. Do not use the P-touch labeler/AC adapter in places of high humidity such as bathrooms and do not overload the power cord. Do not place any heavy object that can damage the power cord or plug. Do not forcibly pull or bend the power cord, as this might damage the cable. Always hold the AC adapter when disconnecting from the power outlet. Make sure that the plug is fully inserted into the power outlet. Do not use an outlet that is loose. Do not use a damaged or leaking battery as the fluid may get on your hands. Q. The display stays blank after I have turned on the machine. What is wrong? A. If you receive blank output from the machine, check that the batteries are correctly inserted into the machine. Many times weak batteries might result in such situation. If the batteries are weak, replace them. Also, check that the AD-24ES adapter is correctly connected. Reinserting the batteries might solve the problem. Q. The Brother P-Touch D200BWVP Label Tape does not feed properly or gets stuck inside the machine. What should I do to overcome this problem? A. In order to print the labels smoothly, check that the end of the Brother P-Touch D200BWVP Label Tape properly feeds under the tape guide. The cutter lever is used while printing is being done so it is recommended to not touch the cutter lever during printing. Q. A blank horizontal line appears when I try to print the label. Is this an issue with the Brother P-Touch D200BWVP Label Tapes? There might be dust on the print head. Expel the tape cassette and use a dry cotton swab to wipe off the printhead with an up-and-down motion.